August 2, 2018—Manasquan Bank, a $1.3 billion community bank headquartered in Wall Township, N.J., announced a strategic alliance with CheckAlt, an independent provider of lockbox solutions in the U.S. Manasquan Bank will initially leverage CheckAlt’s unique lockbox offering, KlikRemit—a nationwide, 14-site hub-and-spoke model offering a highly portable, flexible, and scalable approach to retail, wholesale, and wholetail lockbox processing. 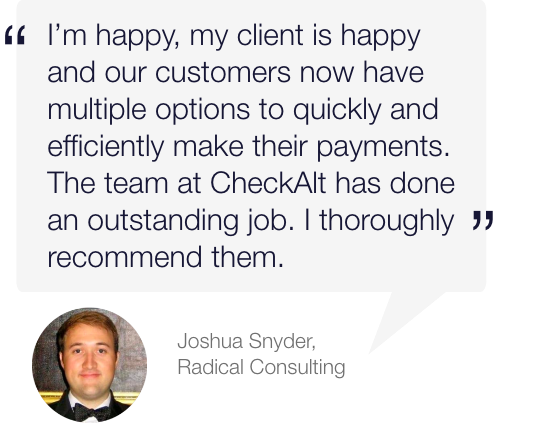 Contact us here to learn how CheckAlt can serve your financial institution or business. CheckAlt is the largest independent provider of lockbox and treasury solutions in the country. CheckAlt’s solutions include lockbox processing across 14 locations nationwide, consolidated item processing, omnichannel integrated treasury solutions and mobile capture services. CheckAlt’s client base includes 600+ financial institutions. CheckAlt is headquartered in Los Angeles, Calif. For more information, visit http://www.checkalt.com.